Our first full-fledged 3D model project was to model a room based on one of the three prompts. The prompt I chose was that of a leprechaun whom gambled away the pot of gold in Vegas and currently is hiding from the other leprechauns in a shack. I chose to incorporate certain elements into the room to imply that it belongs to a leprechaun rather than just a human. I chose some easily recognizable symbols, such as a green hat, a horseshoe, and the pot that previously held gold, but now holds poker chips from Vegas. Also, in comparison to the radio, the mattress looks rather small, which implies a smaller person sleeps on it. I also chose to focus on some smaller details. The walls, for example, are not completely created through texture; each wood plank is a separate object. The nails are also crooked, a result of haphazard hammering. The mattress sinks in the middle, the tables have dents and chips in them, and the candle is at the end of its life. In the end, I didn’t end up modeling a large amount of items, but what I did create I believe I used effectively enough to make up for it. 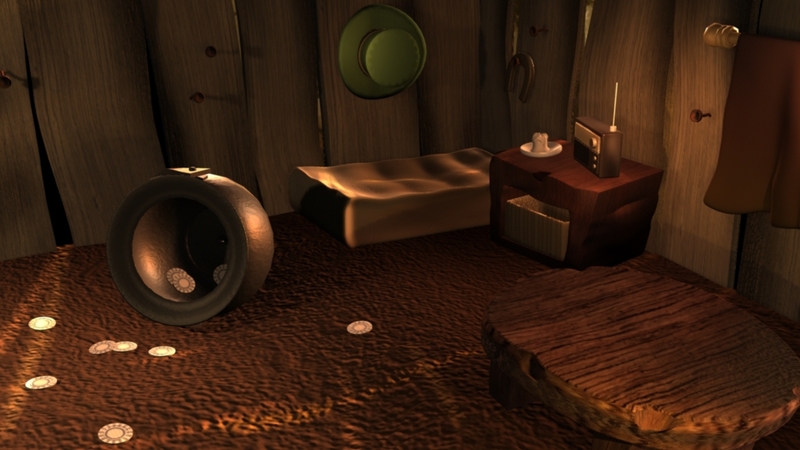 This entry was posted in Non Time-Based and tagged 3D Model, 960px x 540px, Autodesk MAYA, Room Project. Bookmark the permalink.